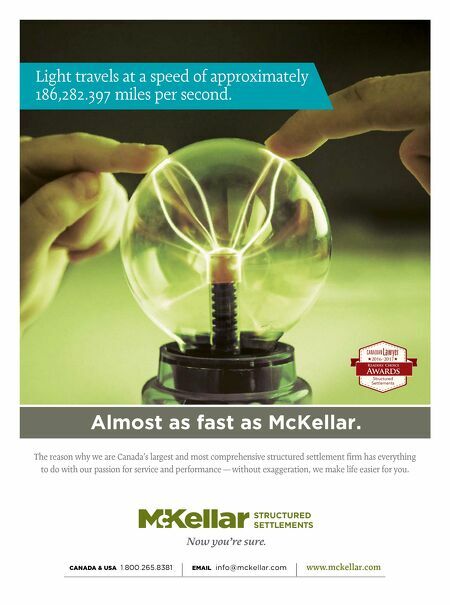 48 N O V E M B E R / D E C E M B E R 2 0 1 6 w w w . C A N A D I A N L a w y e r m a g . c o m CANADA & USA 1.800.265.8381 | EMAIL info@mckellar.com | www.mckellar.com The reason why we are Canada's largest and most comprehensive structured settlement firm has everything to do with our passion for service and performance — without exaggeration, we make life easier for you. Almost as fast as McKellar. Light travels at a speed of approximately 186,282.397 miles per second.